The Garth House opened in June, 1991. It provides an environment which reflects the physical and emotional atmosphere of a home, rather than that of clinic or an institution. 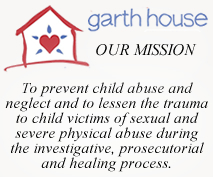 Children who may have been sexually or physically abused are referred to the Garth House by law enforcement and Child Protective Services. We have interviewed over 11,400 alleged victims over the past years. The investigative agencies work as a team. The Garth House provides counseling for our young victims and their non-offending family members.